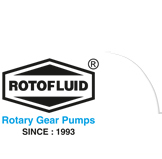 Fluid Tech Systems offer “ROTOFLUID” brand gear pump Model “FTRN/FTRB/FTRX” (Rotary Twin Gear Pump - Molasses Gear Pump - Positive Displacement Gear Pump - External Gear Pump) Which is heavy duty foot mounting type positive displacement rotary twin gear pump. Model “FTRN/FTRB/FTRX” having three piece construction it can be easily cleanable and maintainable. These pumps having a double helical refined gear and hardened grind finished shaft, double helical gear prevent axial load & side thrust which is help to increase life and performance of pump. These pumps are having flange at the end of suction and delivery which are available in 1/2" to 6" size. These pumps can be operated up to pressure of 10 kg/cm² with 8.30 LPM to 2083.00 LPM flow capacity. 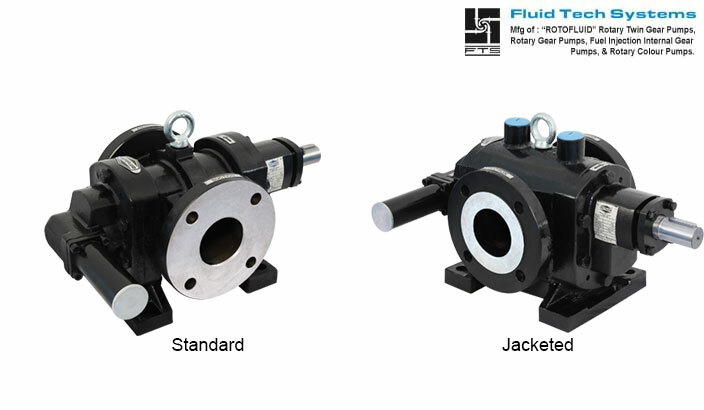 These pumps are suitable for liquid up to viscosity of 1, 00,000 SSU and maximum temperature up to 200ºc. @ Model FTRN/FTRB : The self lubricated needle roller bearing type Model FTRN used for clean viscous liquid having sufficient lubricating property such as clean lube oil, Gear oil, Animal oil, Fish oil, Hydraulic oil, Honey, Vegetable oil, SAE lubricating oil for continues duty, However for Intermittent duty Bush Bearing type pump Model FTRB used. @ Model FTRX : This Model independent lubricated needle roller bearing type pump is suitable for handling of Crude oil, Dirty lube oil, HSD, Kerosene, LDO, Paints, Varnish, Wood Pulp, Liquid which have poor lubricant value. @ Model FTRBJ : This Model should be selected for liquid which tends to solidify at room temperature such as Bitumen, Furnace oil, Asphalt, Tar, Starch, Molasses, Naptha, RFO, Silicate, Wax, Soap solution. Because This model have jacketing construction facilitate the heating the pump by steam or thermic fluid. Heavy duty gear pump design for continuous application. Floating gear design ensures uniform load distribution. Double helical gear design prevent axial load. Low leakage path by design improve volumetric efficiency. Shorter bearing span reduces bending effect. All kind of liquid loading and unloading.